Love these hops, if you've never been on one, here is how it works...(if you know, just skip this paragraph) You read my post, or skim it and just look at the pictures and at the end of the post there will be Name of the next blog in the hop. Click on this name and you get to see what someone else created using the same paper, or layout or whatever the criteria is for that particular hop. There is usually a master list on someone's hop (and this will be noted in my post near the end) so if you get lost or a link is broken, you can check out the master list and pick up where you left off. A simple and easy way to find ideas for your next project. This hop travels across Canada from Coast to Coast and features Close to my Heart Consultants featuring Close to my Heart products. So if you like what you see and want to recreate it, visit my website or your local Close to my Heart Consultant. If you came from Alyson's you were just in Barrie, Ont. And now you're here with me in Three Hills, AB. using the Hello Pumpkin paper. Now head north to Janet in St. Albert and see what she has created. What a lucky girl...love Lagoon with this paper collection! Love that you are creating her an album. My grandmother and her twin sister also have birthday's on Halloween, so I too create Halloween/birthday cards and creations. Thanks for sharing. What a wonderful birthday gift. Ooh! 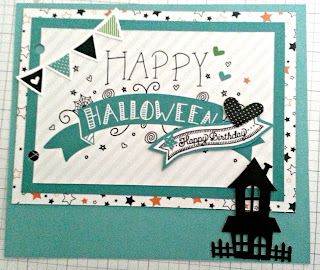 I love your Hallowe'en card!